Developed to increase the firmness and elasticity of your skin, Lift-Up Serum moisturizes while restoring the firmness and definition of your face line. All the rage in Japan...! HABA's skin care product line contains no parabens, flavors, mineral oils, synthesized tar colorings or petrochemical surfactants that can irritate the skin. Many of their products feature high amounts of purified shark liver oil, or squalene. The 99.9% pure result, called Squalane, is extremely dense with oleic acids that are naturally found in our own skin. This makes it a superior moisturizer on its own, but also an excellent carrier of additional nutrients as it penetrates the dermis layer much more deeply than most topical creams and lotions. 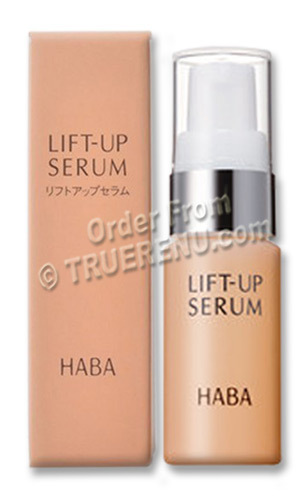 HABA's Lift-Up Serum moisturizes "lifts" and firms your skin to restore a youthful appearance. If you'd like to learn more about HABA, try one of the products - and toss our 10-Product Trial/Sample Set (item 4904) in your shopping cart for a luxurious way to sample many of their most popular products. Choose from a variety of products to create your simple daily regimen: Remove dirt and impurities with HABA pure roots Squa Powder Wash or Squa Cleansing (for makeup cleansing). Tone alcohol-free with G Lotion or new VC Lotion II. Then moisturize with SD Squa Dew, Squa Q10 or Squalane. Further customize your regimen with HABA Special Care products which include Fair Lady (lightening), Squa Q10, Uruoi Densetsu, 2 Way Jell, White Knight, or Umi No Houseki. Use with HABA's original facial treatment device ION MY ESTHE for a beauty salon treatment at home. Just roll the device slowly against your skin for 8 minutes. Your skin will look as if it were treated at a beauty salon! Apply 2-3 pumps of the Lift Serum to the skin immediately after washing your face, either to entire face, or to areas of concern. Feel the lifting effect as you smooth it over your face. Apply Toner afterwards. Ingredients: Water, glycerin, pentylen glycol, butylene glycol, polyglyceryl-10 isostearate, SQ, trisodium ascorbyl palmitate phosphate, methyl gluceth-10, sodium dilauramidoglutamide lysine, glucosyl rutin, dipotassium glycyrrhizate, rosa centifolia flower extract, tetrasodium etidronate. Product Size: Net Volume: 15ml, or about 0.5 US fl oz.